This is a large luxury villa of 700 metres squared (m2) with extensive gardens amounting to 3,500 m2.. There is a lift, two swimming pools and tennis court. 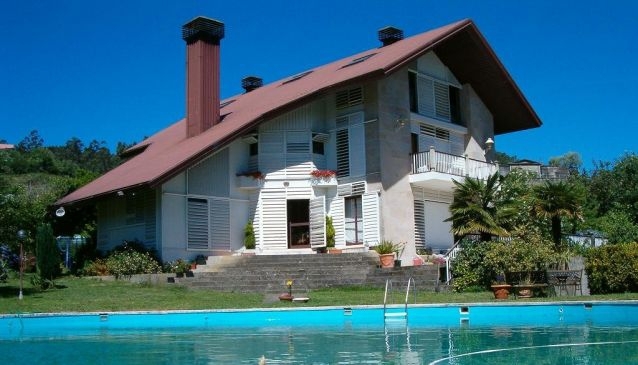 The chalet is of good construction, designed by famous galician architects.. This is a countryside location which is very quiet and safe, just 6 km from Pontevedra.. The villa which is stone built comprises of 600 m2 of livable space in a building plot of 3,500 m2. with stone and iron forged boundary enclosures. There is a tennis court and 2 swimming pools (for children and adults), a lift,country garden with stone pavings, an outside garage and parking for 20 cars, a dinning room of 70 m2 of double height , 4 bedrooms,4 bathrooms, a library of 40 m2 of double height, an office 30 m2, a kitchen with another office and 3 indoor fireplaces, an attic of 110 m2, a basement of 180 m2, oil central heating, a main garden terrace of 100 m2, balconies with the bedrooms, large garden with fruit trees, kiwi, orange, lemon, apple.ornamental trees, magnolio, camellias, maples etc, a spring and farm well, tropical wood floors and terracotta and solid wood carpentry. There is a bus service outside the front gate,there are bars and a supermarket within 50 metres. The distance from the motorway is only 6 km, the nearest airport at Vigo is only 25 km, Santiago Airport is only 60 km, a golf course 15 km, nearest beaches 10 km,a reservoir 2 km,hiking trails, a hospital 6 km and a medical centre is only 4 km away. The property is for sale with the possibility of including part of the furniture.